The L.A. County Museum of Art used to be a hard nut to crack: a huge complex of windowless concrete where the front entrance was never clearly defined and the hodgepodge of its various buildings had no clear order. Although I’ve been to the museum countless times, I never once have had the sense that I’d gotten a comprehensive overview of everything that’s there. Now that the new Broad Contemporary Art Museum is open on LACMA’s sprawling campus (is it considered part of LACMA itself? I’m unclear on that), I was curious to see how the Renzo Piano building full of Eli Broad’s consistently cheerful and LA-centric loaner collection might change the experience of the museum as a whole. And, well, now it’s definitely clear what is considered the main entrance. 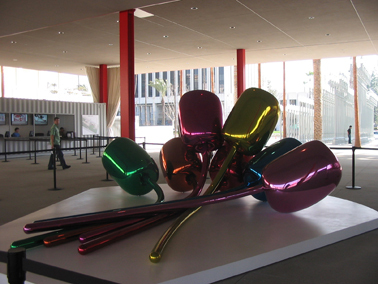 Chris Burden’s light-posts, Charles Ray’s great riff on the old Ruscha’s LACMA-is-burning gag, and the first of the many, many Koons pieces that dominate Broad’s collection surround a portico with the ticket counter that is now sandwiched between the old museum and the new. 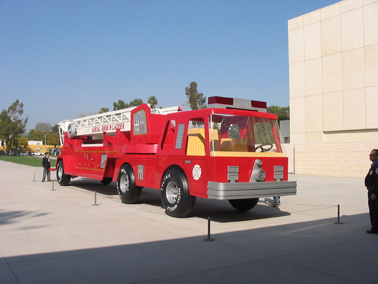 As far as the rest of LACMA goes, I’m concerned that it will be a challenge to get patrons back over to the main campus now that a firetruck and shiny tulips point the way to Piano’s gigantic escalator to the third floor of Broad’s flashy storage house. And it is most definitely Mr. Broad’s museum: each floor is stamped with a gaudy glass plaque near the elevator featuring a stock photo of the Mr. and Mrs. and a carefully worded explanation of the tenuous state of the collections’ ownership. 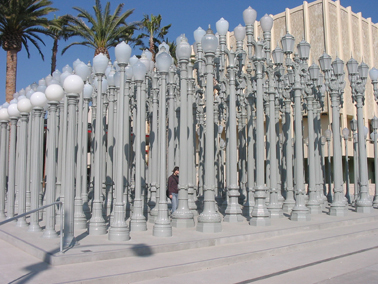 Reading between the lines, even with no background information (like one person in our party), it is easy to parse out the institutional tug-of-war between Broad and the museums of Los Angeles in that paragraph of text. There are some odd features of this museum: it’s a top-down affair, with the escalator ferrying patrons to the third floor and straight into an altar to Jeff Koons. The over-sized elevator, which descends through Barbara Kruger text, has a hastily added bar that cordons off the majority of the floor space, because it can’t handle the weight if as many people as will fit in the elevator all pile in together. The first floor is poorly lit and just a couple of Serras, and by the time you’ve reached the bottom, it’s about as anti-climatic as Richard Serra could possibly get. But the collection, of course, is the art equivalent of walking through the pages of the Oscar issue of People magazine: it’s an all-star extravaganza and everything is dressed up to its show-stopping best. Basketballs? Check. Michael Jackson and Chimp? Check. Silver Mozart? Cindy’s circus? Hirst’s butterflies? Check, check, check. It’s all there, flooded in the natural sunlight that made California an artist’s haven in the first place. I guess I’d have to say in that somehow it all works: like some twisted strange starry-eyed soap-opera befitting Hollywood.